Find the best diabetes care provider for you today! Balansio is not just a self-care app - it enables your trusted care team to be available for you when you need them the most. Balansio combines the knowledge of diabetes care specialists and clinical intelligence to answer the need of timely support. 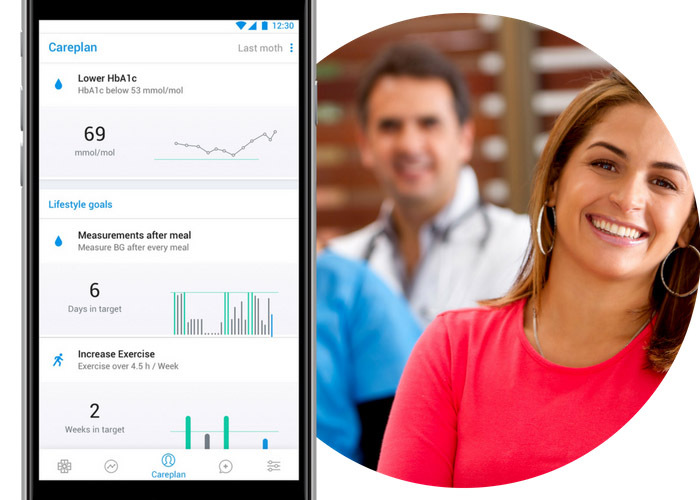 Balansio informs you of issues in your care data, such as high and low glucose values, and lists their potential root causes, so you have a better idea of what may be wrong and how to avoid these situations in the future. Balansio also highlights the same issues to your diabetes care professionals, so that it gets easier to discuss the matter and how to avoid similar situations in the future. With full visibility to your care data, timely help, right tools and continuous support, you can achieve better care balance resulting lower risk of complications and more enjoyable daily life. Request the help you deserve, live more care free life and feel less exhausted from your diabetes care. Balansio includes a wide range of functionalities that you could expect for modern diabetes care. Clinical intelligence, medication calculation, A1c-estimation, compatibility with different BG and CGM meters and all this in easy-to-use format designed specifically for people with diabetes. On top of that you get assistance from your health care professionals whether you are at work or in a holiday destination. Balansio not only collects your self-care data and provides it to your doctor, but it also interprets the data and provides the most important pieces of it directly to your and your doctor's use. It enables you to achieve results and not think about your condition so much. Have you ever had a hard time estimating your bolus dosages? The Bolus Calculator embedded in Balansio will do it for you! Easy-to-use calculator is a CE certified Class 2b medical device for the automatic calculation of rapid-acting insulin (U100) dose proposals based on your current blood glucose, eaten carbs and previously taken rapid-acting insulin. It also adjusts your dose based on your personal settings for different life situations, at any time of day. bolus calculator is easy and fast to use! Manually saving your BG measurements and activity is a hassle. Balansio connects with a variety of BG and CGM meters and other devices and applications for your benefit. Storing your other self-care data has been made easy and straight forward - and in this case more is better! According to your automatically and manually provided self-care data, Balansio assistants and your health care service team are able to give you guidance and support you in everyday life with diabetes. Keep your phone in your pocket - With an Android Wear smart watch you can handle all daily tasks from your wrist. diabetes care provider for your holistic care and professional support!